This. This is pretty much the most amazing thing I’ve ever made. That’s a bold statement, but I’m willing to risk it. 1. Combine chocolate chips, peanut butter, butter and vanilla. Melt together. I used a 2 cup Pyrex measuring cup and microwaved it for about 2 minutes, stirring every 30 seconds or so. 2. Put popcorn in a large bowl and pour the chocolate/peanut butter mixture over it. 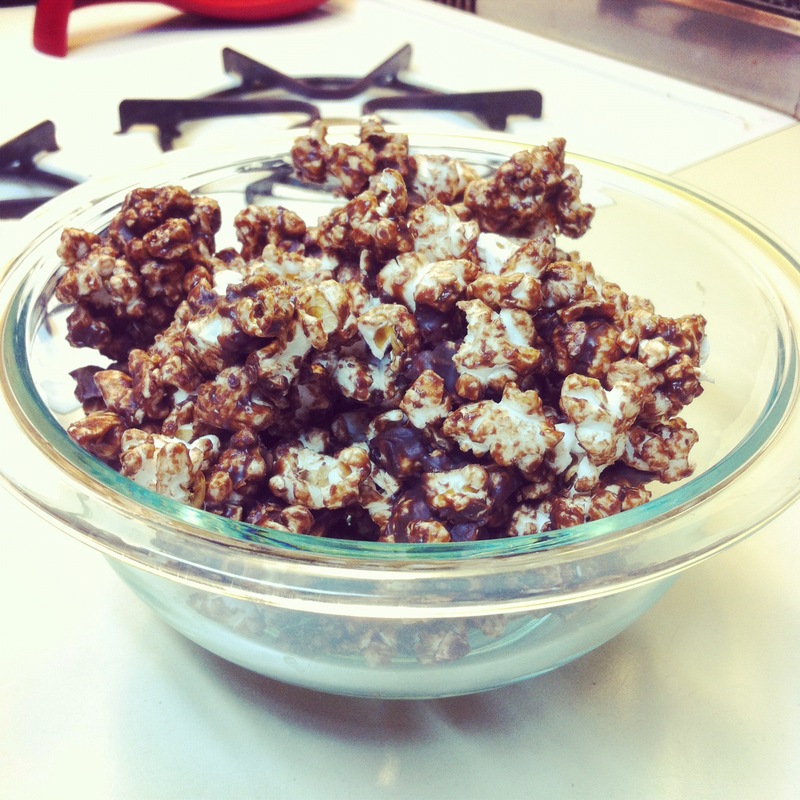 Using a spatula, mix to cover all of the popcorn with chocolate. If you’re making a mess with the spatula, take a second bowl, place upside down on top and shake to combine. 3. Line a cookie sheet with waxed paper and spread the popcorn out. Place in freezer for 30 minutes. 1. Heat the oil in a large pot over medium heat. Test heat by adding 3 kernels of corn and covering with lid. Your oil is hot enough when all 3 kernels have popped. 2 Add remaining popcorn, place lid on pot and shake. Shake for 3 seconds, let it rest for 3 seconds, shake for 3, rest for 3, etc. Keep shaking until you can count 3 seconds between pops. Wow. This recipe blows my mind. I am making this right now!